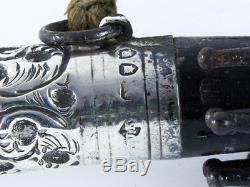 1892 Victorian Sterling Silver Handled Ladies Quality Umbrella. 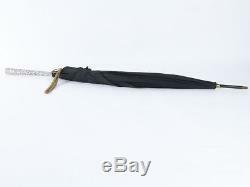 A beautiful, high quality Victorian Ladies' umbrella in very good clean condition. The umbrella has a long, highly ornate embossed scroll decoration handle that is made of Sterling Silver which is Hallmarked London 1892. The black silky satin is in very good fresh condition with no holes. The umbrella opens and closes well. Size: 6 x 91cm Weight: 473g. Have a look at our other items. If you have any questions we are more than happy to help. _gsrx_vers_811 GS 7.0.9 (811). 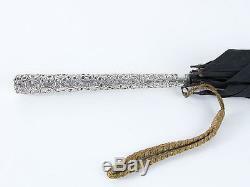 The item "1892 Victorian Sterling Silver Handled Ladies Quality Umbrella" is in sale since Friday, May 30, 2014. This item is in the category "Antiques\Silver\Solid Silver\Other Solid Silver".